In the past few years the television show The Simpsons, which this year will celebrate its 30th anniversary of being on the air, has come under fire for its stereotypical, white-voiced portrayal of the Indian character Apu. Remarkably, an entire documentary was made on how troubling one Indian comedian found the character, and last year the show attempted to address the controversy, much to the disappointment of its critics. But is Apu the only moral failing of The Simpsons when viewed through the politically correct lens of 2019? In the comedy canon, the Fox show, and specifically season 4, is considered by the old guard (white American men) to have been “the best which has been thought and said.” But does it really hold up, or was The Simpsons just more stories from white guys? As joking around (what the pretentious call “comedy”) becomes the dominant Western religion, and being “woke” becomes the standard by which everything is judged, it is important that we are woke about joking but never joke about woking. As it’s written in The History of the Communist Party of the Soviet Union: “A party is invincible if it does not fear criticism and self-criticism.” It’s time to self-criticize our past laughter. It’s time we criticized The Simpsons with 2020 vision. As the meme goes, “The Simpsons did it (first).” Indeed, the show was, with almost no self-awareness, a disturbing celebration and product of America’s hydra-headed beast: the patriarchy, late capitalism, and whiteness. Because Homer was a “lovable” oaf we never noticed his toxic masculinity. Because the series gently satirized middle-class life we never noticed its blind eye toward Springfield’s marginalized. And, poignantly, because the white people were drawn in yellow we never noticed its white supremacy. The Simpsons arrived in 1989, during the death rattle of white American dominance in pop culture, epitomized by the arrival of grunge at about the same time. So much ’80s pop music pointed toward our inclusive future: multicultural, diverse, gay, and tinged toward the Dionysian. Grunge was white suburbia’s Counter-Reformation, its last attempt to impose its own tastes (ugly white noise, ironic distance, suicidal depression) on the masses. The early Simpsons, with its irony and cynical attitudes, was grunge television. Pitched as subversive by edgy white Gen-Xers in the early ’90s, the show today codes as ideologically backwards. The Simpsons was created by Matt Groening, who was born and raised in 1950s Portland, Ore., giving him the whitest possible origin story and three strikes right off the bat. Of course the show would be an unwoke disaster: Groening emerged from the belly of the white beast. He staffed the show with too many white guys from Harvard (including Conan O’Brien, runner-up to Whitest Guy Ever) and even a “staunch conservative libertarian” (John Swartzwelder). Looking at a picture of the writing staff from 1992, one sees so many white men crammed into the frame it is enough to spontaneously trigger an R.E.M. reunion tour. I weep when I think of what a female-led writers’ room, staffed with mostly people of color, could have done with the premise of the show. It could’ve given us a classic. So many of Springfield’s minor characters are wallowing in their white privilege (they are failures while still able to own businesses, buy a home, etc.). Actor Troy McClure, lawyer Lionel Hutz, Barney the town drunk—they all epitomize the white guy letting his privilege go to seed. And when they’re not wasting their privilege, to see a white male character on the show is to see a potential Trump voter: evangelical Ned Flanders, gun-store owner Herman Hermann, bus driver Otto. Seeing a crowd scene on The Simpsons, with all those yellow (read: white) people, it almost gave me an anxiety attack on more than one occasion. Ned: Homer, God didn’t set your house on fire. Reverend Lovejoy: No, but He was working in the hearts of your friends and neighbors when they came to your aid, be they Christian, Jew, or…miscellaneous. The character of Bumblebee Man, a slapstick Spanish performer who is never even given the dignity of revealing his real name (Pedro Chespirito) until much later, is supposed to represent the lowbrow ways of Mexican television, but a glance at American network TV in 2019 shows that it’s the ironic, detached, and embarrassingly white shows such as The Simpsons that have fallen away. Bumblebee Man represented mainstream entertainment’s glorious demographic and cultural future—he could even feature on Fox’s The Masked Singer. The characters of Lenny & Carl (Homer’s co-workers), or Lou & Eddy (Springfield police), are both a relic. Carl and Lou are both black but by design don’t differ much at all from their white counterparts. That’s because their singular blackness would’ve scared ’90s America. Carl and Lou needed to taper their blackness so white America could feel safe watching a supposedly edgy comedy. That Lou works as an officer for Chief Wiggum is no coincidence. Having a black man on the force lends The Simpsons’ police a moral authority that doesn’t survive in 2019. Indeed, the high jinks of Chief Wiggum in 1992–93 are a reminder of how white supremacy functions in law enforcement: A bumbling white police chief is funny—to white America. The reality is that bumbling white police chiefs get people of color killed. Wiggum is no exception. 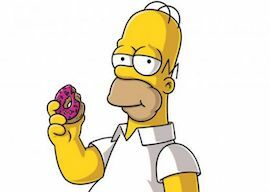 If the show took place today, Homer would undoubtedly be wearing a MAGA hat and watching Last Man Standing, Lisa would not be a lesbian or even a first-female anything because she would by now have transcended the binary concept of gender, and Bart would’ve passed away from an Oxy overdose at age 37. Mr. Burns would’ve replaced Homer’s job with either robots or H-1B visas at the nuclear plant. Speaking of Mr. Burns, by the standards of 2019 he’s actually one of the show’s heroes. Burns is a billionaire (or, as Howard Schultz wants them be called, a “Person of Means”) who has as his second-in-command Smithers, a member of the LGBT community. This is the Steve Jobs–Tim Cook corporate succession template, and it’s actually beautiful. I’m sure in the years since 1993 that a real-life Smithers would’ve provided a moral compass and pumped some much-needed racial and sexual diversity into Springfield (perhaps even bringing it up to par with neighboring Shelbyville). As bad as Homer was, the character who has aged the worst is Bart Simpson. Celebrated initially on T-shirts with his cheeky signature catchphrases, Bart was, in hindsight, the last of the great 1980s smart-aleck white guys (a tradition that goes from Ferris Bueller to President Ronald Reagan). With his smug, punchable face and bratty attitude—and presciently wearing a “lucky red hat”—Bart Simpson eerily resembles the smirking, snide Covington teen. With our enlightened, woke hearts we see just how far this “perfect show” fell short, even during its so-called golden era. If you want great, enlightened comedy that’s in tune with the way the world actually works now, today, check out The Good Place or Broad City (the latter is sadly ending soon). As for The Simpsons, like its beloved character Poochie, it died on the way back to its home planet. A planet called Whiteness. Note: For the next column like this, we will dynamically reconsider the Beatles oeuvre in light of their musical and cultural appropriation of black and Indian peoples, and John Lennon’s treatment of women.